In November 2005, the Hayabusa spacecraft performed touchdown rehearsals, imaging navigation tests, and two touchdowns on Itokawa, which is by far the smallest asteroid ever studied at high resolution. These operations provided close-up images with resolutions up to 6mm/pixel. 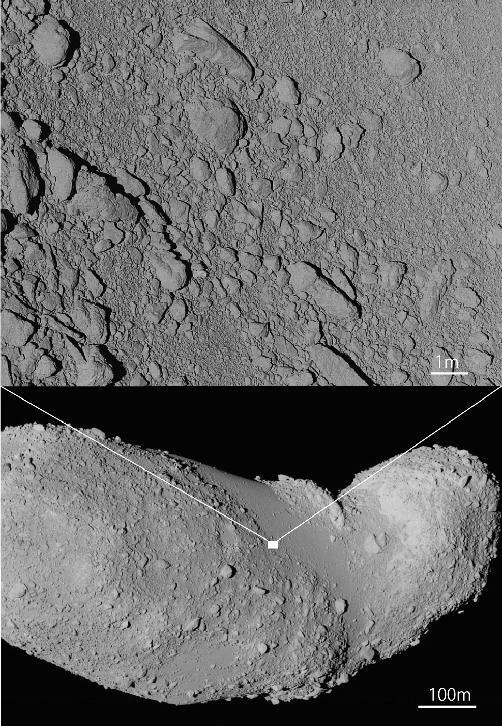 The upper image is one of the best resolution images of the surface of Itokawa, whose location is indicated in the lower image. The upper image shows a close-up of the boundary area between the boulder-rich “rough” terrain and the pebble-covered “smooth terrain”, which is called Muses-C region. It is obvious from close-up images that the surface of Itokawa is covered with unconsolidated gravels, which are typically piled on each other without being buried by fines. The existence of unconsolidated gravels, especially the ponds of well-sorted pebbles in smooth terrains, was surprising because regolith on a small asteroid is believed to keep only a small amount of regolith due to the low escape velocity. The upper image appears to be similar to a terrestrial landslide deposit. Scientists, Hirdy Miyamoto and Bob Gaskell, found well-developed imbrications in several close-up images, including in the upper image. The imbrications indicate the direction of gravel migration (from lower left to upper right in this image), always match with the local gravitational slopes. Thus, there should be global-scale gravel fluidizations, which resulted in the regolith segregations and local concentrations on the surface of Itokawa. The fluidity is believed to be triggered by impact-induced vibrations. Miyamoto, H., et al., Regolith Migration and Sorting on Asteroid Itokawa, Science 316, 1011-1014, 2007. E. Asphaug, The Shifting Sands of Asteroids, Science 316, 993-994, 2007. A. Fujiwara, et al., The Rubble-Pile Asteroid Itokawa as Observed by Hayabusa, Science 312, 1330-1334, 2006.